The Food Institute recorded a total of 381 mergers in the larger food and beverage industry in 2011, an increase of about 20 percent over the 317 deals in 2010. The Food Institute recorded a total of 381 mergers in the larger food and beverage industry in 2011, an increase of about 20 percent over the 317 deals in 2010. While the numbers are comparatively high when considering the lull in 2009 that followed the recession, when mergers dipping to 264, they're well below recent highs of 422 in 2008 and 473 in 2007, when credit was good and money was cheap. Among just food and beverage processors, the results are similar: 63 mergers were completed, another 17 are still pending, higher than the 58 in both 2009 and 2010 but below the 110 recorded in three consecutive years: 2006-2008. In addition to interest in growing segments, the activity also marks the re-entry of private capital and investors into the food industry, the institute notes. The first half of the year started positively with a combined 196 announced and finalized mergers, a rise of approximately 27 percent over those in the same period of the previous year. But MandA's declined somewhat in the second quarter, partly a reaction in the market to uncertainty fostered by poor economic data in the U.S. and the debt crisis in Europe. At the time, many analysts predicted that cash-rich strategies were returning to the market. M&A bankers stated that fears of a "double dip" recession, the European debt crisis and continued market volatility held up a lot of acquisition activity, and those problems are not anticipated to be resolved in the near future. But companies that waited through the recession and hoarded capital emerged to scoop up companies and make acquisitions that supplemented organic growth as growing economies could no longer be relied on for revenue. On Oct. 3 of 2011, Sara Lee Corp. completed the sale of its North American Refrigerated Dough business to Ralcorp Frozen Bakery Products, a division of Ralcorp Holdings, Inc., for $545 million. The business generated revenues in excess of $300 million in fiscal 2010. It also presaged Sara Lee's split (concluded this June) into an American processed meats company (Hillshire Brands) and a European coffee company (D.E Master Blenders 1753 N.V.). As a result of that strategy, Sara Lee also sold a majority of its North American foodservice coffee and tea operations to J.M. Smucker Co. for $350 million, but acquired Aidells Sausage Co. for $87 million. Ralcorp was the target of an acquisition itself, but refused to enter talks with ConAgra Foods Inc. about its $5.18 billion takeover bid, which began in March of 2011. Analysts claim Ralcorp's board risked costing shareholders a billion dollars by walking away from ConAgra's offer in favor of splitting up the company. The Food Institute claims current Ralcorp and the Post Foods unit it spun off were worth a combined $86 per share at the time of the separation, while ConAgra was offering $94 (and the Food Institute says it could have been $104 a share) to secure a deal (according to BMO Capital Markets and reported by Bloomberg Businessweek Sept. 15, 2011). Retailers, which the Food Institute considers part of the bigger food industry, also were busy. The biggest deal in the supermarket category merged BI-LO LLC with Winn-Dixie Stores Inc., creating an organization of approximately 690 grocery stores in eight states throughout the southeastern U.S. The deal is valued at about $560 million. The Great Atlantic and Pacific Tea Co. spent most of 2011 under bankruptcy reorganization, and in the process sold seven Super Fresh grocery locations in Maryland and one Super Fresh location in Washington, D.C., to natural foods retailer Mrs. Green's Natural Market. AandP emerged from Chapter 11 protection this March as a smaller private company. The Lowe's grocery store chain, based in Texas, purchased Super S Foods, which had 55 stores in the state. In the restaurant segment, a Golden Gate Capital affiliate bought California Pizza Kitchen Inc. A Roark Capital Group affiliate acquired Arby's Restaurant Group for $430 million, which was being divested by the Wendy's/Arby's Group. Roark Capital also purchased Il Fornaio, which operates restaurants and bakeries. Yum! Brands Inc. signed definitive agreements to sell Long John Silver's Inc. and A&W Restaurants Inc. to two separate buyers, while McCormick and Schmick's Seafood Restaurants Inc. was acquired by Landry's Inc. for $131.6 million. The foodservice industry was active, too, with Aramark Refreshment Services LLC purchasing all outstanding shares of Van Houtte USA Holdings, Inc., also known as the Van Houtte U.S. Coffee Service business, from Green Mountain Coffee Roasters Inc. for approximately $145 million. U.S. Foodservice continued its streak of acquisitions by acquiring Vesuvio Foods Inc. in 2011, a distributor of Italian foods for pizzerias, Italian restaurants and gourmet shops. It was the firm's eighth acquisition of the year. U.S. Foodservice also unveiled a new corporate name: US Foods. In the courts, a settlement between Barclays Capital, Del Monte Corp. and Del Monte's shareholders will likely have an enormous impact on sell-side financing in public buyouts. The nearly $90 million settlement, one of the largest in a shareholder lawsuit challenging a merger-and-acquisition transaction, was also unique in that the bank advising a company, rather than just the company itself, was named as a defendant, reported The Wall Street Journal (Oct. 7, 2011). Shareholders alleged that Barclays Capital, which advised Del Monte on a sale to a private-equity consortium including KKR, Centerview Partners and Vestar Capital Partners last year, was conflicted because it also arranged financing for the buyers and did not disclose that. The settlement followed a decision in February 2011 by the Delaware Court of Chancery that Barclays manipulated the sale process to boost its fees and colluded with the private equity firms. Investment firms should be discouraged from offering financing to buyers when they are advising the seller, according to industry observers. 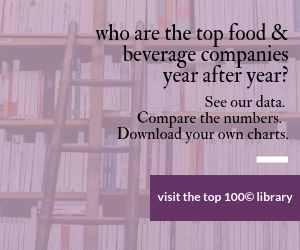 When it comes to our annual ranking of the 100 largest food and beverage companies in the U.S.